Terry O’Neill is one of the twentieth century's most accomplished and collected photographers, whose work hangs in national galleries and private collections around the globe. Since picking up a camera in 1958, O’Neill has produced magazine covers for Time, Newsweek, Vanity Fair and many other renowned publications, photographing presidents, royalty and some of Hollywood’s most iconic stars. O’Neill’s camera has chronicled the frontline of fame, particularly the emerging rock stars and actors of the swinging sixties. He photographed The Beatles and The Rolling Stones when they were still struggling to get a recording contract, and snapped Oscar-winner Faye Dunaway by a Beverly Hills poolside in what has been described as the most iconic Hollywood shot of all time. Armed with nothing but a roll of 35mm film, he brought a whole new candour to celebrity photography that hadn’t been seen before and is unlikely to be seen again. To browse our collection of limited edition Terry O'Neill prints for sale, please visit our dedicated artworks page below. Born 30th July 1938, Terry O’Neill grew up in the East End of London, and initially harboured dreams of becoming a professional jazz musician. By age 20, he sought to pursue that goal by taking a job as a flight attendant. In his estimation, he planned to use rest days from long haul flights between New York and London to establish himself as an international jazz drummer in the Big Apple’s legendary jazz clubs. Sadly, this planned route to jazz infamy did not go as O’Neill intended, and he was stopped at the first pass when the airline informed him they had no openings for stewards. Instead, he was fatefully directed toward their photography department, which O’Neill optimistically viewed as an eventual route into becoming an airline steward, and later, a great jazz drummer. However, within a year, O’Neill secured a job as the youngest photographer at British tabloid The Daily Sketch, where he worked from 1960 to 1963. Consequently, O’Neill’s early pictures became some of the first pop music photography to be published in newspapers. His very first job in his new role was to photograph a then-little-known beat group called The Beatles. 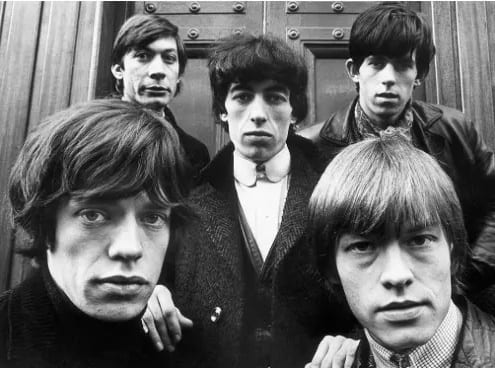 Following that, O’Neill was given free reins by his employers to photograph some of his favourite bands, including The Rolling Stones. Aged just 24, O’Neill travelled to Hollywood, freelancing for Vogue, Paris Match and Rolling Stone. Most celebrated of his Los Angeles works are his photographs of a sullen Brigitte Bardot smoking in the wind, and of Faye Dunaway—who he went on to marry—the morning after she won her Best Actress Oscar for the film Network in 1977. 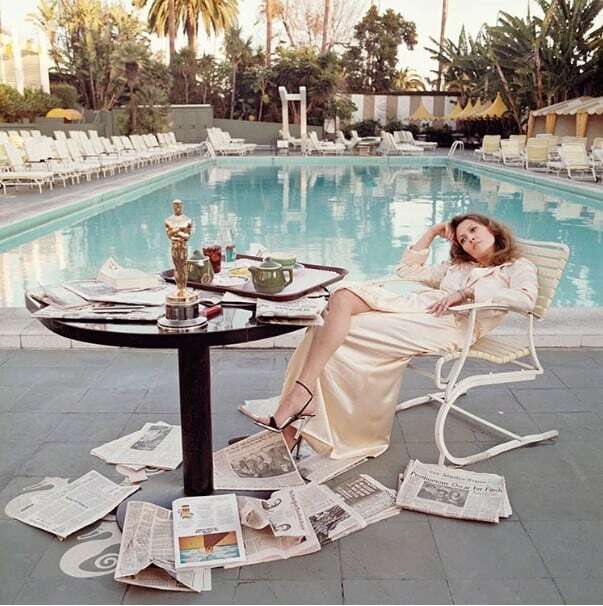 Lounging by the Beverly Hills Hotel swimming pool at dawn, the image depicts Dunaway in a night robe, surrounded by several newspapers proclaiming her victory, and her Oscar statuette prominently shown on a table beside her breakfast tray. The series of shots were photographed in both colour and black & white. One image from the series hangs in the permanent collection of the National Portrait Gallery in London, and is widely regarded as the most iconic Hollywood shot of all time. In the decades that followed his move to Los Angeles, Terry O’Neill became one of the world's most published photographers on both sides of the Atlantic. In addition to photographing the decade's showbiz elite such as Judy Garland, Frank Sinatra and Twiggy, he also photographed members of the British Royal Family and prominent politicians, showing them in a more natural and human light than they had been portrayed in the past. Now in his early 80s, O’Neill continues to work, having notably completed a week-long assignment photographing Nelson Mandela for an intimate portrait of the statesman shortly before his death. He remains the photographer of choice for many of today’s household names, such as Simon Cowell and Gordon Ramsay. In 2011 he was awarded The Royal Photographic Society's Centenary medal in recognition of a sustained, significant contribution to the art of photography. In September 2016, Ransom Art Gallery exhibited O'Neill's extensive archive of David Bowie photography to coincide with the publication of the book 'Bowie By O'Neill'. The exhibition, which included iconic shots of the musician with author William S. Burroughs, amongst other legendary images from the singer’s 1974 Diamond Dogs tour, then moved to Mouche Gallery in Beverly Hills, Los Angeles from 29th October until 9th November 2016.